These .45 ACP 200 grain +P jacketed hollow points are boxer-primed with a muzzle velocity of 950 FPS and are law enforcement grade. This case of Speer .45 ACP ammunition contains twenty, 50 round boxes. 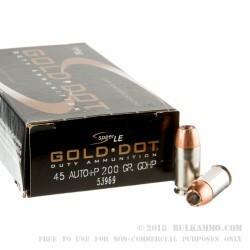 Speer Gold Dot self-defense ammunition has become a legend in law enforcement and home defense circles. With their bonded core bullets, Speer uses their UNI-COR method to bond the jacket and the core at the beginning of manufacturing. This essentially eliminates any core and jacket separation, making for a more consistent and accurate hollow point. Each round uses CCI boxer-primers, clean burning powders and nickel plated, reloadable brass cases to ensure uniform performance gun to gun. 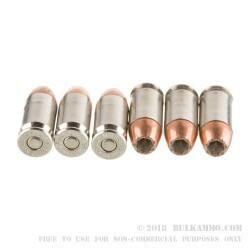 Each bullet also goes through a unique process for the hollow point cavity, giving Speer control over how the bullet will expand and the rate of expansion after impact. All Speer hollow points are tested to the FBI’s service handgun tests to ensure performance. 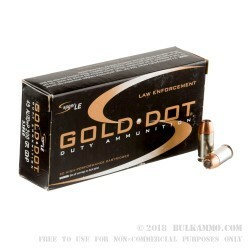 Made in Lewiston, Idaho, Speer ammunition with their Gold Dot and Lawman lines, have become one of the most trusted providers of ammunition by law enforcement agencies and carry permit holders across the USA. This ammunition is + P ammunition, and fires at higher pressures than standard ammunition. Make sure your firearm is approved for +P ammunition.